Tips to grow your new million dollar idea into a thriving business. Understanding the forms and practical steps for starting a business. Tax Advice for Starting a Business. Donna persevered through law school and set up a firm as a single-mother battling cancer. Leveraging your invention is often just as hard, if not harder, than coming up with the invention. Six points to help you understand the process of bankruptcy of a business better. 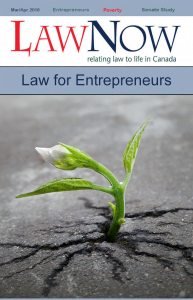 Many new businesses place legal concerns on the back burner due to time and cost constraints. Much work needs to be done if we seek to rely on the Charter for a right to adequate housing. Homeless people should be encouraged to vote and given equal opportunity to do so. Generally, someone files for bankruptcy when something catastrophic happens. Are Environmentalists Good or Bad? Human Rights Law and Employment: Does Context Trump Relationship?